Q. What is the Maryland Boating Safety Certificate? A. The Maryland Boating Safety Certificate (also known as the Maryland Boating License or boaters license) is proof that you have met the mandatory boat safety education requirements for the State of Maryland. The Maryland Boating Safety Certificate is good for life and does not need to be renewed. Q. Boating License or Boater Safety Certificate... is there a difference? A.The boater education card is proof that you have successfully completed a boating safety course. The boater education card does not expire and does not need to be renewed. Therefore, it is NOT a Maryland Boating License! Q. I do not have a driver's license. Can I still get the Maryland Boating Safety Certificate? A. Yes. You are not required to have a state driver's license in order to obtain a boater education card. Q. How can I get my Maryland Boating License? Q. Who needs a Maryland boater license? A. All persons born on or after July 1, 1972, are required to have a certificate of boating safety education in order to operate a motorized vessel in the state of Maryland. For more information please consult the Maryland boating laws and regulations page. Q. How long is the boat safety course and boater license good for? A. The boater license is good for life. Q. How much does the boat safety course cost? A. There is a one-time fee of $29.95 paid to BOATERexam.com®. It includes unlimited attempts at the final exam. Learn more about BOATERexam.com's Risk-Free Policy. Q.What do I need to pass the boating license test? A. You need a grade of 80% or higher on the boating license test to pass. That means 60 correct answers out of 75. Q. Can I review my Boater Exam answers? A. Yes, once you have completed the boating license test and submitted all your answers they are graded immediately. You have the opportunity to review all your Boater Exam answers, whether you have passed or failed the Boater Exam. Q. Are there Boater Exam practice tests or sample boater exam questions available? A. Throughout the boat safety course, you can take end-of-chapter-quizzes that prepare you for the final exam. These chapter quizzes are short boater exam practice tests that cover the same topics that are present in the boating license test. Q. 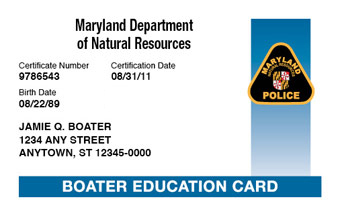 Is anyone exempt from obtaining the Maryland Boater License? A. Yes, there are certain exemptions from the boat safety education requirement. For more information, check out the Maryland Boating Laws page.